Today, many believers do not have a deep understanding of the meaning of the Lord's Supper, they do it mostly as a spiritual ritual, but it must be done with a meaningful understanding of what happens each time we carry it out. What happens is that it must be revealed, in the same way that it was revealed to the Apostle Paul in 1 Corinthians 11: 23-24 "For I received from the Lord what I also taught you: May the Lord Jesus, the night he was delivered He took bread, and having given thanks, broke it, and said, Take, eat: this is my body which is broken for you: this do in remembrance of me. " According to this word, to which it refers: "Do this?" , then to take the Holy Supper. And here the word "Memory" means being taken back to the point where Christ died on the cross of Calvary. Gentlemen, the sacrament is not a tradition, it goes beyond a ritual, it is something of the now, we are taken to that moment in which Christ died, he was scourged and in that moment of the crucifixion is that He bore our sins. Therefore, we can ask ourselves what happens when you take bread and wine? 1. As we expressed earlier, we are first brought into the spirit and translated when Christ was on the cross. 2. It is a reminder of the defeat of satan. Because the moment we drink wine and bread, in the spiritual world, you are telling the devil, who is dethroned, defeated, destroyed and disarmed. 3. A portal opens in the spirit, and only opens with the sacrifice of worship, offering, prayer and fasting. That is why God says: And I will open the windows until there is an overflow. Because through that portal, it is where God tells what he did on the cross. Therefore, we can say that the Blood has the same power as 2,000 years ago. That portal is for healing and deliverance. Because when they are open, provision is always coming. That is why many times, when people have revelation of this, they are healed, they are liberated during the Holy Supper.
! Corinthians 11:26 says "Therefore, as often as you eat this bread, and drink this cup, …". As the Word manifests, we can take the Holy Supper at any time. First when our pastors indicate it. Or I have an oppression, etc., we do it because we want an open portal. So every time you take it, the manifestation is not for tomorrow, but it is for today and that is why when you take the sacrament, something must happen when you have this revelation. 4. The sacrament represents a covenant with God. 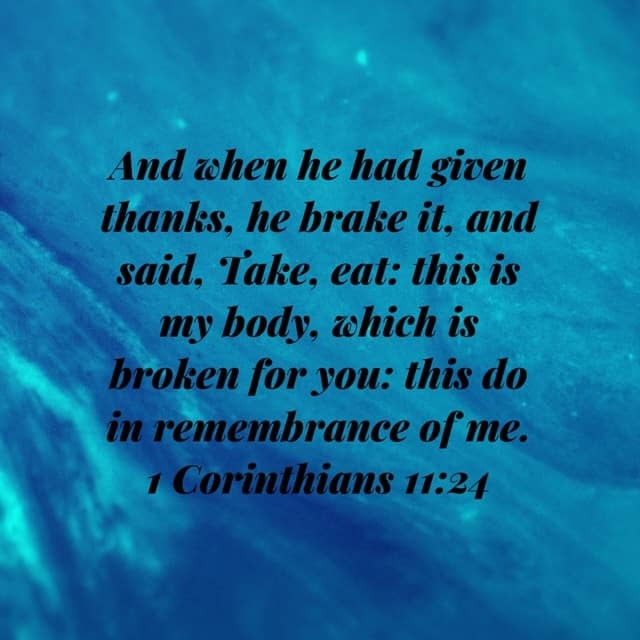 1 Corinthians 11:25 "And he took the cup also, after having supped, saying, This cup is the new covenant in my blood, do this as often as you drink it, in remembrance of me." This is a commitment to God and in taking Holy Communion, it is also an act of consecration to God. And it is an act to open a portal of heaven. In the Old Testament, the night before beginning the departure to the promised land, God told the people of Israel, to sprinkle the blood of the lamb on the doors of their homes. In the spirit field it was a prophetic act to say: the blood is on and when the angel of death came to the door, he looked at the blood as a sign of protection and passed by without harming the families. As a sign of protection. At that time, they were sprinkling blood, but today it is different. Revelation 12:11 "And they overcame him by the blood of the Lamb and by the word of their testimony." a. We apply it first on our lives. b. And second, we apply the blood in the area where God will work. Example: When we have had bad thoughts, or think we have a cancer just because a mole has come out, or someone betrayed you, or lost a business, or you are frustrated and think negative things. These fire darts came to his mind, then, we apply the Blood over the mind. Maybe you have had a dream with nightmares and we can not speak the Word, let's say: I SHOCK THE POWER OF THE BLOOD OF JESUS. I COVER WITH THE BLOOD OF JESUS. If you are sick with a knee, you say: I APPLY THE BLOOD OF JESUS ​​ON MY KNEE. If there is a financial problem, I SHOW THE BLOOD OF JESUS ​​ON MY FINANCES. And so. The truth is that in the spirit, there is a line of demarcation. The demons see that there is a protection. The Blood pulls a line of demarcation, which says "here you do not pass". That's why you have to declare it every day. Because when you do it, you activate the angels in your life. They move about what we declare. When we unleash the Blood of Jesus, they begin to work. It is also important that when you take the sacrament, you must take it with dignity, that is, have asked God for forgiveness for your sins, be in good standing with God, otherwise you will bring condemnation to your life. Whatever the Blood is unleashed, God covers it and protects it. Why does the Blood of Jesus have so much power? Let us begin this explanation based on Leviticus 17:11 "For the life of the flesh is in the blood, and I have given it to you to make atonement on the altar for your souls, and the same blood will make atonement for the person. " Life is in the blood and there is no covenant without sacrifice. A greater sacrifice, greater power and the sacrifice of Jesus is above all, because he shed his blood. And that's why when he repents and asks God for forgiveness, his sins are forgiven. Then when asking for forgiveness, sins are put out of existence, there is no guilt, and God does not remember them anymore. In the blood is the life of the person who is giving it. The Blood of Jesus is supernatural, it is the resurrection life of Christ, it is the power of Christ. It is the supernatural life of the Triune God. It is the eternal supernatural life of the Triune God, because life is in the Blood offered to God on the altar has redemptive power. That is, when the Blood is offered, that Blood corresponds to the value of the life that is in it. Therefore, the value of the Blood of Christ corresponds to the value of the life of the Triune God. Blessed be the Blood of Jesus. The value of the Blood of Christ corresponds to the value of the life of the Triune God. All the value of the three is in his Blood. The blood of Abel cries out for justice and judgment, but the Blood of Jesus cries out for mercy. Therefore, the Blood of Jesus has so much power, because the Blood that was poured out was not that of an animal, but the Blood of the Son of God. And where the Blood of Jesus is unleashed, there is a presence of God. Now is the time to pray and take the sacrament: "Father, we raise our bread and our cup, this is the Blood of the Lamb of God, which I received from the Lord, the night that Jesus Christ was delivered, if there is something in my heart that offend, we ask that your Blood cleanse us, if there is anger, sin, resentment or anything that displeases you, we ask you to forgive us and cleanse us. Father God, it is this day, I declare Jesus Christ as my Lord and my God. I believe in Jesus, I believe in his sacrifice, I believe in everything he gained on the cross, and at this moment, I take his body and drink his Blood. I move to that moment when Christ paid for my sins. Jesus, I believe in your finished work. A portal opens up, of deliverance, of salvation, of protection, of financial prosperity over my life. I remind Satan of his defeat, he was disarmed, destroyed and dethroned. I beat him with the Blood of Jesus and the word of the testimony. What I testify overcomes. On this day, I receive my healing, my deliverance, and a portal opens in heaven. In the name of Jesus I apply the Blood on my mind, my body, my spirit and my soul. I draw a line of demarcation where the devil can not pass, because no weapon forged against me can prosper, because there is blood in the lintels of my house. No disease, no plague, nothing can cross the line of demarcation. I declare the Blood, the life of God, where the power of God is, I unleash it on my family, my children, my properties, my cars, my homes, and on all my possessions that have a protection fence. Nothing can touch it. Now I receive and strengthen the covenant with miracles, with provision and protection. Thank you for your blessed flesh, as your body and I drink your Blood. Amen."